According to the 2016 Global Peace Index, the world has become increasingly dangerous with only 10 countries considered completely free of conflict. The refugee crisis, terrorist attacks and military conflict have all combined to make the world less peaceful this year than it was last year. Scientists believe one-third of humanity cannot view the Milky Way - this includes 80% of Americans and 60% of Europeans because city lights are creating fogs of light pollution, according to a new study published in the journal of Science Advances. 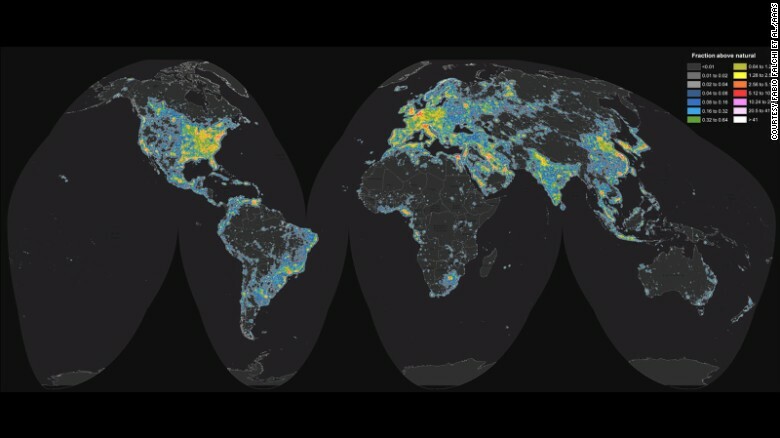 Moreover, light pollution causes global ecological consequences, poses public health issues, and wastes energy and money. Hundreds of cancer-causing chemicals are building up in the bodies of Americans, according to the first comprehensive inventory of the carcinogens that have been measured in people. In 2014, for the first time in more than 130 years, adults ages 18 to 34 were slightly more likely to be living in their parents' home than they were to be living with a spouse or partner in their own household. America is number one - in incarceration. Over the past several decades, the country has built the largest prison population in the entire world, with the second-highest prison population per capita behind the tiny African country of Seychelles. Though rural areas and small cities have more jobs than they did at this time last year, the rate of growth remains slower than in urban areas. From April 2015 to April 2016, a third of rural counties saw a net decline in the number of jobs. The US solar industry expects to install 14.5 gigawatts of solar power in 2016, a 94% increase over the record 7.5 gigawatts last year, according to a new market report by GTM Research and the Solar Energy Industries Association. MACDEP members Katie Weaver and Pat McGlynn and I gave a presentation at the recent 2016 ANREP-NACDEP Conference in Burlington, VT on our upcoming 2017 CDS-NACDEP conference; Our 2017 Conference theme is "Big Skies, Bold Partnerships: Moving Mountains Together." More info about the 2017 Community Development Conference at www.2017CDS-NACDEP.org. The Montana State University Community Development Program social media platforms are undergoing a facelift; please follow our work via our Facebook and Twitter. The International Association for Community Development is recruiting individuals to serve on our Board of Directors; please email me for more information. Also, please consider joining the IACD as a full member; contact membership@iacdglobal.org for more information. Among the many benefits, you'll receive a copy of our publication Practice Insights; the latest issue covers articles on community development practice in Europe, China, India, Nepal, Oceania and North America. Keep up to date with the lessons from practitioners around the world.